Damn! This winter has been a brutal one so far. Sure, I say that most winters but after two weeks of well below zero Fahrenheit temperatures and living in a drafty old house with a boiler that seems it can only handle keeping rooms comfortable if it is above 20°F (and that's being generous), the shiver aspect has been high and heavy both inside and out this season so far. I imagine the shock level is going to be a huge zap too when the home heating bills start to roll in over the next couple of months. Warmth is key. Along with an electric blanket things, a bit bigger on the boozy end have helped in such pursuits. No, the booze part doesn't actually help keep a person warmer but helps in not caring that it is practically like Siberia outside in these parts right now. 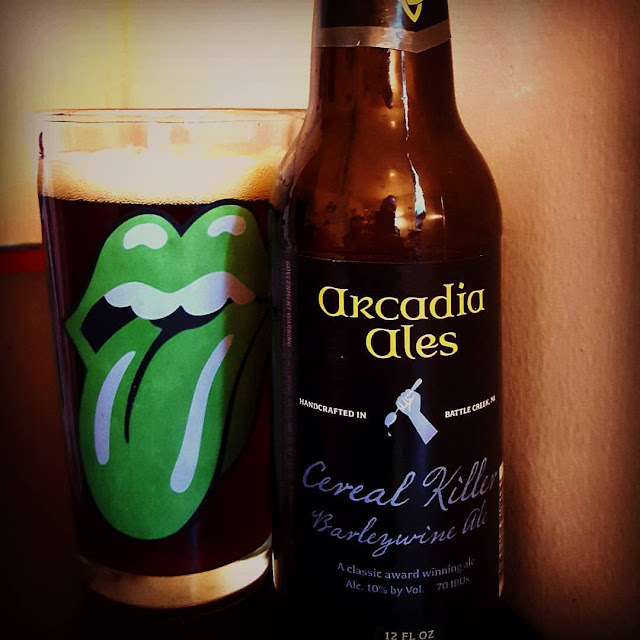 I don't recall if Arcadia Ales Cereal Killer was the first "traditional" barleywine I ever had but my first taste of one of these was over a decade ago. I've never gotten around to writing about it though. Picking up a 4 pack of them a couple of weeks ago though, I've decided it was time to get around to doing just that. Mahogany in color and a two finger head that holds on for a moderate amount of time, Cereal Killers looks the way an English barleywine does. Scents of dark fruits such as plum and cherry along with sweet malts, toffee and brown sugar are quickly noted. Hops not swatting the nose around here show this Battle Creek, MI brewery didn't set out to Americanize their take on the style and are paying tribute to the way they've been doing it in the UK for centuries too. Dates, grapes, caramel and spices come right out on the initial sips. There's a bit of sweetness there too but nothing overly or aggressively candied or sugary. The 10% ABV brings some heat right behind that but that takes a step to the side too as a bit of cherry and vanilla bean arrives towards the finish. Medium bodied and smooth all the way through, it ends with a semi-tart and somewhat dry. Almost like Sauvignon but not as jammy and a bit boozier. I don't know if this brew would actually lead me to commit homicide to a bowl of Malt-O-Meal, but it is the kind of thing that would be proper to drink before going out and rasslin' a giant. I feel warmer already.